Wednesday September 7th 1881 I soon got the house cleaned up and things to rights and did some sewing during the day. Hatt was over all day but felt wretched with the tooth-ache. Mrs Trowbridge, Mrs Sanders and Hutchinson spent the afternoon here. I went over town after supper. 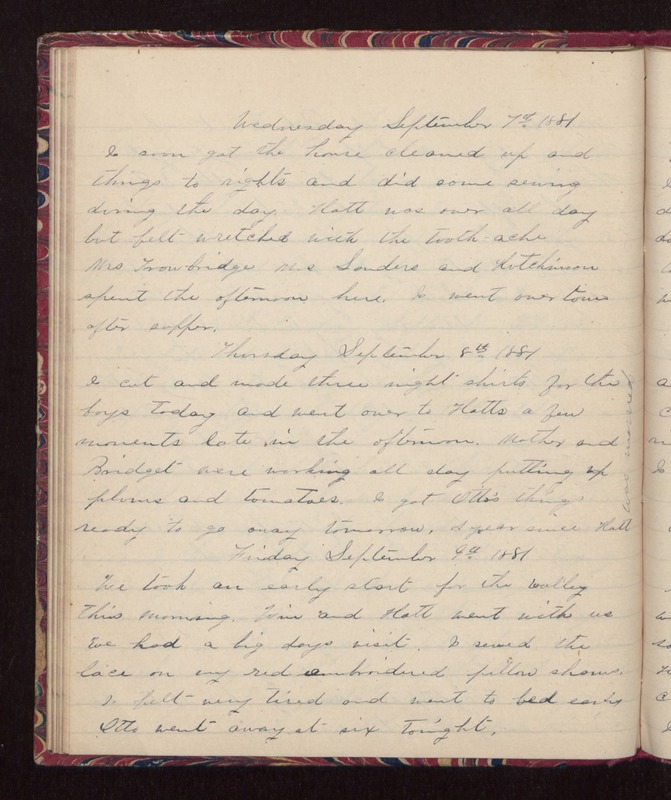 Thursday September 8th 1881 I cut and made three night shirts for the boys today and went over to Hatts a few moments late in the afternoon. Mother and Bridget were working all day putting up plums and tomatoes. I got Otto's things ready to go away tomorrow. A year since Hatt was married Friday September 9th 1881 We took an early start for the valley this morning. Win and Hatt went with us. We had a big days visit. I sewed the lace on my red embroidered pillow shams. I felt very tired and went to bed early. Otto went away at six tonight.